Senate Democratic Leader Andrea Stewart -Cousins and Senate Democrats announce they will propose hostile amendments on gun control measures on the Senate floor Wednesday February 28th. PHOTO BY KAREN DEWITT. 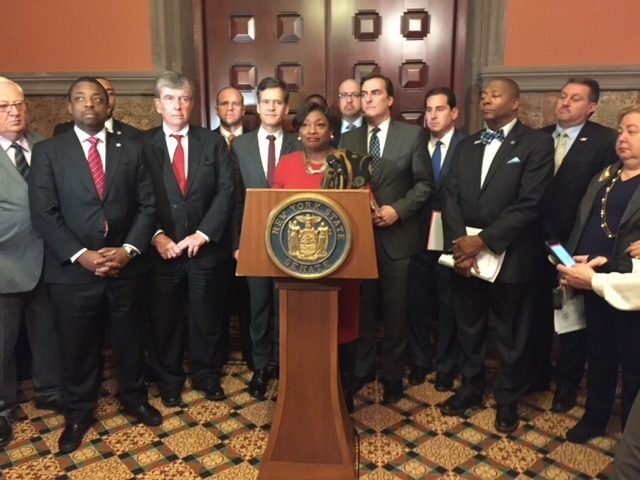 ALBANY, NY (WSKG) – Democrats in the state Senate tried to force a vote on gun control legislation Wednesday, to put Republicans on the spot over some GOP senators’ resistance to the bills. Senate Democratic Leader Andrea Stewart-Cousins said the measures include banning possession of bump stocks. They also permit a judge to limit a person’s access to guns if they are deemed likely to harm themselves or others, known as the Extreme Risk Protection Order. The other provisions include allowing New York state scientists to conduct research on the effects of guns and gun violence. That research is banned on the federal level. And they would expand the three-day waiting period for buying a gun to ten days. On the Senate floor, Democratic Senator Brad Hoylman, who sponsors the bump stock ban, said the state can’t wait for federal action. He said too many in Congress are beholden to the National Rifle Association. “We should spit in the face of the NRA today,” Hoylman urged his colleagues. No Republican senators spoke on the floor, and a vote, by a show of hands, was called. 29 Democrats and members of the Independent Democratic Conference stood up and raised their hands. 30 GOP senators sat silently, and the amendment was rejected. Two senators were absent, including Brooklyn Democrat Simcha Felder, who caucuses with the Republicans, and Senator Joseph Griffo, a Republican from Utica. Senate Majority Leader John Flanagan did not speak publicly but he did issue a statement, saying the GOP is “hard at work on a comprehensive school safety plan,” that will include strengthening school security. He says Republicans are talking in party meetings and will have bills as early as March 5. Senate Deputy Majority Leader John DeFrancisco confirmed the discussions. But he said when it comes to limiting access to guns, there needs to be a balance to ensure that everyone has a right to “due process.” But he said he’ll look “very seriously” at proposals to limit mentally ill people’s access to guns. Deputy Senate Democratic Leader Michael Gianaris, speaking on the Senate floor, said he supports adding more security at schools but said it’s “mind boggling” that we are talking about making locations safer, but not making people safer. New York already has some of the most restrictive gun laws in the nation, known as the SAFE Act, and passed after the Newtown, Connecticut school shootings five years ago. It limits the purchase of assault weapons and related ammunition, among other measures. Several Republican senators approved the measure, but other GOP senators have said they’d like to see it repealed. Gov. Cuomo has been on national media touting the successes of the SAFE Act, which he championed. He has also agreed to pool data on gun purchases with other neighboring states to help in background checks. In a conference call, Cuomo did not wholeheartedly endorse the bills by the Senate Democrats. Senator Stewart-Cousins says she’s certain the governor is “equally interested in protecting the lives of New Yorkers,” but she said the measures introduced on the Senate floor Wednesday are really about the legislature taking action, in its first days back after the Parkland Florida school shooting.